Especially for children who are not yet independent, it is important in the dark season to be recognized in time by motorized road users. “Safety first. 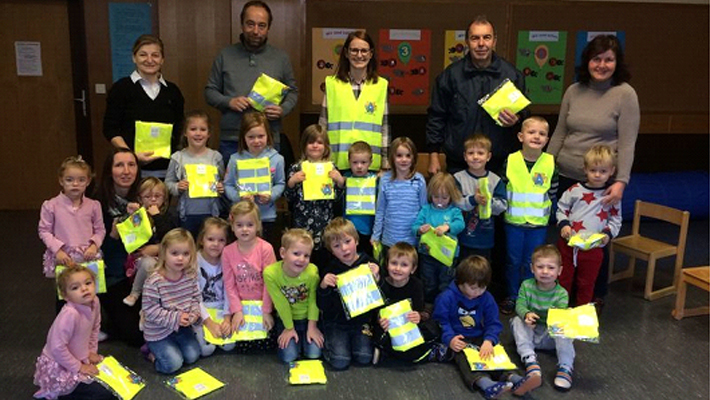 That’s why I’m particularly pleased that the Upper Austrian Civil Defense offers warning vests for kindergarten groups as part of an Upper Austria-wide promotion, “said civil protection district manager Gerhard Gierlinger, who already handed over the safety vests to the kindergarten in the community Waldkirchen / beings with Vice Mayor Engelbert Leitner. The aim of the action is to make the kindergarten children on excursions, walks and the like more visible. As a bonus, each kindergarten group receives a safety bag, which corresponds to the design of a safety vest and reflective tapes on it. The kindergarten pedagogue can use it as a backpack and is, therefore, a “visible role model”. In addition, there is a safety memo developed by the O Zivilschutz for the kindergarten, a safety game that illustrates children’s everyday risks and avoidance of danger. In addition to reflective vests and reflective bags, reflective fabrics are also a good choice.